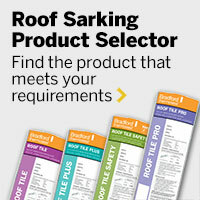 Roof sarking is classified according to its reflective properties and/or vapour permeability. Reflective properties determine the thermal contribution of the product and vapour permeability determines the ability of the sarking to control the flow of water vapour which influences condensation control. Selection of the most appropriate roof sarking is dependent upon the climate region, type of construction and amount of roofing blanket (for metal roofs) and ceiling insulation being used. As thermal insulation properties can be effectively managed with the addition of bulk insulation, the key variable that roof sarking should control is condensation – this involves the control of water vapour from either outside (in humid climates) or inside (in cooler climates where the interior is heated). Depending upon the type of building construction, insulation levels and climate zone in which you are building, the selection of the right roof sarking is critical to ensure the energy efficiency of your home and long term health of your family. As a general guide the following climate map can be used to select the most appropriate roof sarking, but as this is a complicated issue, further more detailed information can be contacted by contacting CSR Bradford to access our extensive condensation modelling library for most climate regions around the country. Hot humid summer - Recommended product range: Non-permeable roof sarking and foil faced roofing blanket – lapping and taping of joins and penetrations is required in this region to achieve a vapour seal for condensation control. Warm humid summer - Recommended product range: Non-permeable roof sarking and foil faced roofing blanket – lapping and taping of joins and penetrations is recommended in this region to achieve a vapour seal for condensation control. Hot and dry summer with mild winter - Recommended product range: Non-permeable roof sarking and foil faced roofing blanket is recommended for use with most levels of insulation. Hot and dry summer with cold winter - Recommended product range: Non-permeable or vapour permeable roof sarking and foil faced roofing blanket is recommended for use with most levels of insulation. Warm summer with cold winter - Recommended product range: Non-permeable roof sarking and foil faced building blanket is recommended for use with lower levels of ceiling insulation ( less than R3.5 ceiling batts) and vapour permeable roof sarking is recommended for applications with higher levels of ceiling insulation (greater than R4.1 ceiling batts). Mild summer with very cold winter - Vapour permeable roof sarking is recommended for all applications with ceiling insulation and foil faced building blanket may be used with metal roofing when combined with ceiling batts. Lapping and taping of joins and penetrations is recommended in this region to improve energy efficiency. Please note that these are generic product recommendations based upon typical building usage and normal construction practices in accordance with the BCA and Australian Standards when compared against the Australian Bureau of Meteorology temperature and humidity data for an average year. If you are in doubt, please contact CSR Bradford.